blocked. Then it will be put aside till I get to work on the jumper. 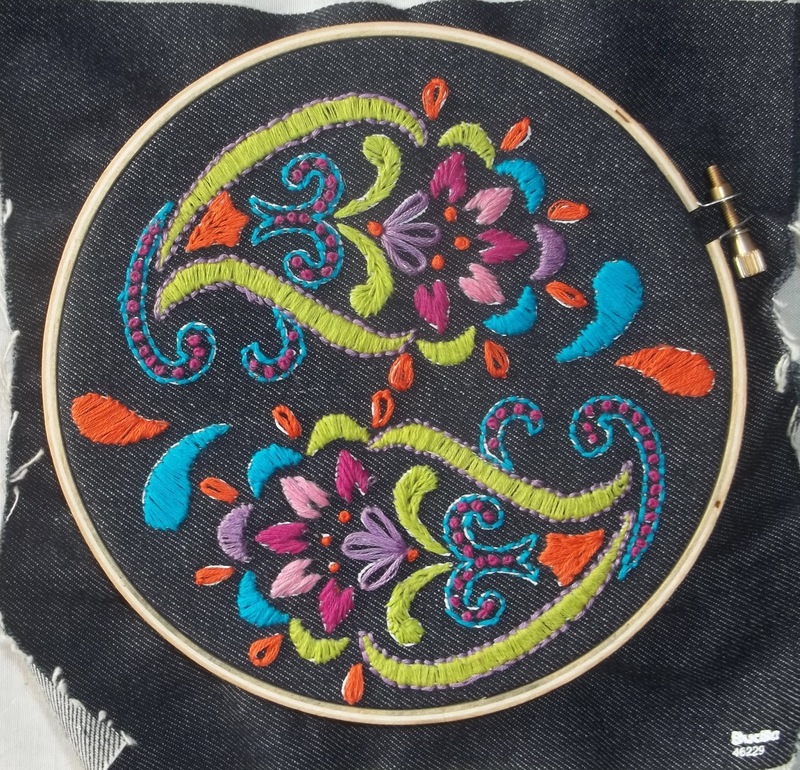 Aside from finishing this embroidery, there was no sewing this Saturday. I might get the top cut tomorrow (in the AM) come the PM I will be baby sitting the girls. This coming week, I have two Dr's appointments--one is an eye exam. Which is, to my thinking, a bit of a priority—I need new eyeglasses! I tend to wear frame less or half frame less eyeglasses—and last month, I dropped my current pair—and while looking for them (a difficult task to see frame less glasses when you can see clearly unless wearing them) I managed to step on them. I didn't break the ear piece or the lenses, —but I did bent them at the hinge, and now they are too loose—and annoy me by slipping off, or sitting lopsided. My Rx doesn't change much, but, it is still a good policy to have my eyes checked before getting another pair—which will likely be the same Rx. I still find myself removing my glasses for fine work (as I type this, they are perched on top of my head)--and I still don't have any problems threading needles (but I do need more light—threading the sewing machine is the easiest—the handy little light that focuses right on the task at hand means I get the task done in a single try—Threading 3 or 4 plies of floss is a little harder—but with my Ott light handy, no effort at all. My other big project for the day was clearing a slow running drain (in my tub) –Done! How exciting! Not as much fun as sewing but then, life isn't all fun and games. This week has been one of small tasks, mostly mundane—Laundry, and bills, shopping and cooking...cleaning and clearing—including cleaning out clothes—Some are going to be packed into bags for recycling... Others, got mended, and added back into rotation (a hem repaired, a button sewn on, small things—but needed repairs. I didn't feel well for 36 hours this week. (Wednesday to mid day Thursday) –so I pigged out binged watched the newest episodes of House of Cards. Not very productive, but something accomplished! (there are also new episodes of Shameless to watch, and new stuff like the Keeper, and.. I have some free movie tickets—Beatrice at Dinner is one film on my list. Movies are a good respite on really hot days—there will be plenty this summer no doubt. In a moment of impulse, I purchased yet another specialty sewing machine foot—One for sewing circles—It will be a useful tool, I think. 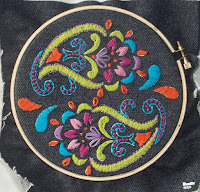 with a zig zag stitch and rotation, little flowers will appear. I still need to purchase some non iron on interfacing and tear away interfacing for doing some machine embroidery—Maybe even a special hoop for machine embroidery—Oh What a splurge! But mostly, my sewing will be simple stuff. So not much done—a quiet week of every day stuff—the basic things of everyday life, and everyday joy.